The auditorium at LeMoyne-Owen College was a sea of dressed-up teenagers and proud parents Friday afternoon. 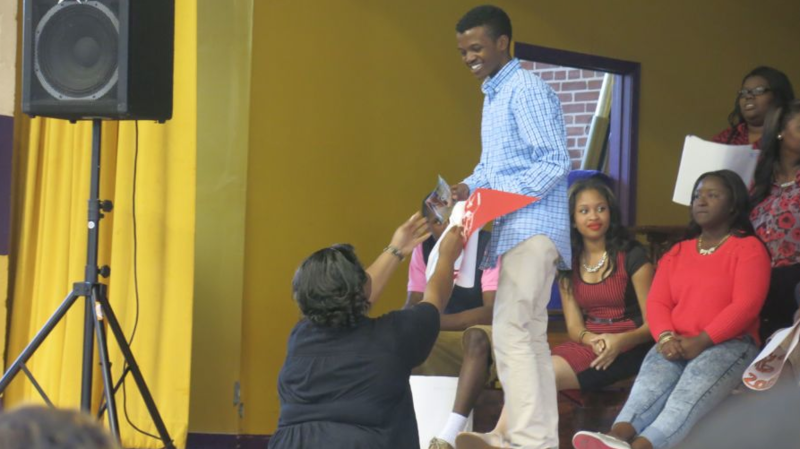 But it’s not graduation quite yet: Today was Soulsville Charter School’s third annual “Decision Day,” where each of the school’s 53 seniors announced to family and peers where they plan to attend college. In a city where just 40 percent of public school students are college-bound, every one of Soulsville’s seniors was admitted to a four-year college, and many were admitted to more than one. Soulsville seniors also earned more than $10 million in scholarships. Two students, Zakiyyah Chism and Justice Washington, earned more than $1 million in scholarships individually. The high admissions rate is no fluke, says Meggan Kiel, the director of the school’s college and alumni support team. Soulsville seniors and juniors have a class every day that focuses on college preparation, and the school has a four-member team—two full-time—specifically focused on college and alumni support. “Each of these students went through a difficult process to find, financially and academically, the best fit for them,” said Ashley Shores, the director of Soulsville’s high school. Some students smiled, some strutted, and others were close to tears as they were called to take center stage. Each senior stood as a teacher read aloud the names of each college they’d been accepted to and listed all the scholarships they received. Then, one by one, the students unveiled handwritten signs. “I am continuing my education at Southwest Community College,” one student said. “Next year, I will be attending Davidson College,” another said. As students celebrated their achievements, Soulsville was celebrating a milestone: While previous classes had achieved 100 percent admissions to two-year colleges, the class of 2014, the school’s third graduating class, was the first to have all of its students admitted to a four-year college. Some students plan to attend two-year schools. Soulsville’s mission is to “prepare students for success in college and life in an academically rigorous, music-rich environment.” As the number of charter schools in Memphis continues to grow, Soulsville, supported by the Soulsville Foundation, remains the city’s largest. The school holds an unweighted lottery for admission, but explicitly targets students who are zoned to failing schools or who have been struggling at their own schools. The school’s student population is not atypical for a Memphis public school: In 2012-13, Soulsville’s students were 98 percent African-American, 9 percent have disabilities, and 80 percent were eligible for free and reduced-price lunch. In the same year, 81 percent of Memphis City Schools students were African-American, 13.7 percent had disabilities, and 84 percent of students were economically disadvantaged. Hoping to improve its academic track record, the Shelby County Schools district, which includes Memphis, is preparing a new strategic plan that aims to graduate 80 percent of its students college- and career- ready and ensure that 100 percent of students who are college- and career-ready take advantage of a postsecondary opportunity. Currently, 30 percent of students are deemed college- and career-ready, some 70 percent of the district’s students graduate, and 60 percent of the district’s graduates head on to postsecondary education. But the district’s level of support for college-bound high schoolers currently pales in comparison to Soulsville’s: District high schools with as many as 749 students are assigned just one guidance counselor. Schools with 1,000 high schoolers have two counselors. At Soulsville, juniors use the college preparatory course to prepare for the ACT, and seniors write their college essays and complete their FAFSA (Free Application for Federal Student Aid) forms. The school has an “office” for the students that includes computers and a fax machine. Seniors can leave their cell phones in the office so they can make calls to universities if they need to. “We don’t ask them to do it all at home,” Kiel said. That intensive support doesn’t stop after students graduate, Kiel said. Through social media, phone calls, and in-person visits, the college and alumni support team stays in touch with Soulsville students who are in college. Many of this year’s seniors plan to stay in Memphis. Jacquine Rankin came to the LeMoyne auditorium Friday with a pair of helium balloons, one for each of her two senior children. One is heading to Southwest Tennessee’s nursing program, and the other to Christian Brothers University. “The teachers did a lot of the footwork to prepare them for college,” Rankin said. Dozens of Soulsville alumni also attended Friday’s event. Earlier in the day, alumni talked to seniors about their college experiences so far. “They told them, hey, you really will have to do your homework,” said Janessa Jordan, an English teacher at the school. Seniors walked on to the tune of the Pharrell Williams song “Happy” as the audience applauded.